From left to right, David Farrar, Aidan Ritchie-Dickinson, Cheyanne Thompson, Cheyenne Tehkummah, Abigail Kelly, Don Lynch. Photo by Sarah Janes. Eighty-three years after that description was published, Anderson’s son, Don Lynch, says there couldn’t be a better way to remember his mother. In 1935 Anderson became the first Indigenous woman to graduate from McMaster. Born in Ohsweken, Ont. 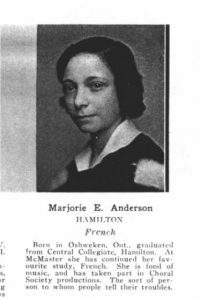 in 1913, Anderson, one of 10 children, went to university as a French major at a time when very few of her peers were even considering post-secondary education. As McMaster Associate Professor Rick Monture put it, going to university was “like going to Mars,” for many young Indigenous women. Now a new grant named in honour of Anderson, who died in 2002, is helping Indigenous students pursue post-secondary education at McMaster. Established in 2017 as part of McMaster’s response to the Truth and Reconciliation Commission’s report, the Marjorie Anderson Academic Grant for Indigenous Students awards up to $80,000 ($20,000 per year) to Indigenous students from the Six Nations of the Grand River or the Mississaugas of the New Credit starting their first year at the university. The four inaugural winners of the grant were honoured Thursday morning at an event hosted by Student Financial Aid and Scholarships and Indigenous Student Services. At the event, Lynch — who was joined by Marjorie Anderson’s sister, Jacquie Dale, and Monture, another relative of Anderson’s — shared memories and anecdotes of his mother, including a fitting story of how Anderson almost didn’t graduate because her government financial aid was unexpectedly pulled. “My grandfather went in and spoke to someone at McMaster and the response he got was ‘they can’t do this to us.’ I always liked the emphasis on ‘us’ in that response,” said Lynch. “The financial aid was restored, and she was able to graduate. The winners of the grant — Abigail Kelly, Social Sciences; Aidan Ritchie-Dickinson, Engineering; Cheyenne Tehkummah, Social Sciences; and Cheyanne Thompson, Social Sciences — were selected by a committee of McMaster faculty and staff. 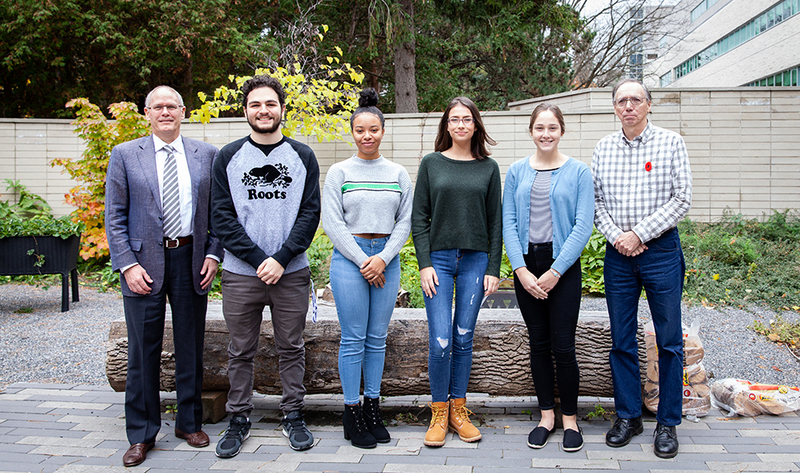 For the four students, winning the grant has provided crucial financial assistance to help them achieve their post-secondary goals. Lynch says helping students further their education is the perfect tribute to his mother. Applications for the 2019-20 Marjorie Anderson Academic Grant for Indigenous Students will be available through the Student Financial Aid & Scholarships website.